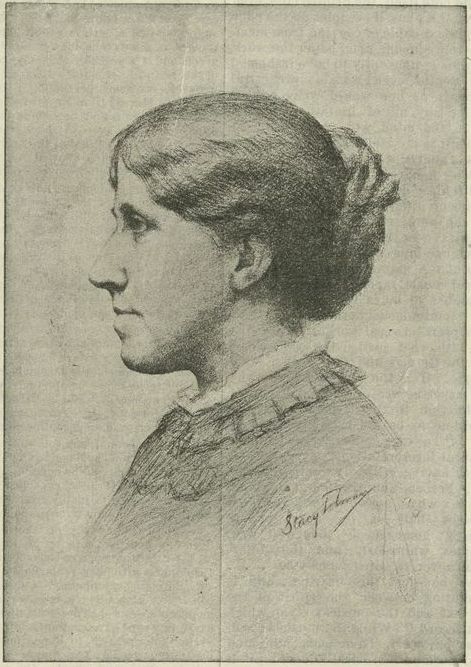 Today is the birthday (in 1832) of Louisa May Alcott, who I have always thought of as a real Massachusetts girl, with her Transcendentalist upbringing, her independent spirit, and her lifelong reformist tendencies. Sometimes it’s hard to separate her from Jo in Little Women, but she was a real person who served as a Civil War nurse (briefly) rather than waiting at home in Concord, who had many menial jobs, who wrote sensationalistic penny dreadfuls under a pseudonym as well as her classic bestsellers, and who was a lifelong abolitionist and suffragette. She never married, and died at 55 from what some people say was lupus, others mercury poisoning, and she herself thought might be meningitis. I know Louisa had her own life, but I can’t help associating her with Jo, primarily because of the movies rather than the book. 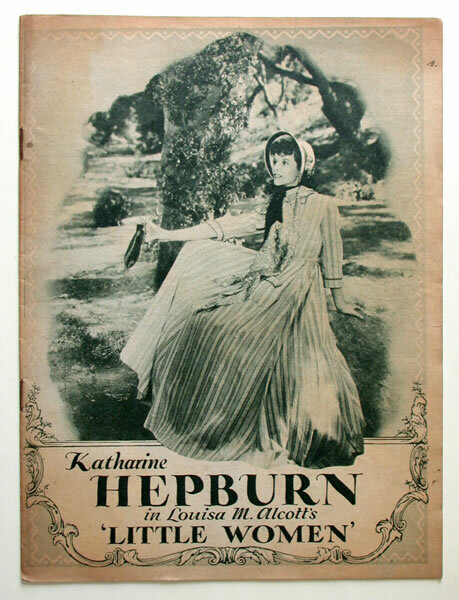 When I picture Louisa, I generally think of Katherine Hepburn playing Jo in the 1933 version of Little Women, rather than June Allyson in the 1949 version or Winona Ryder in the 1994 film; I think June and Winona did well, but Kate is seared in my memory. If I had not seen any of these films, perhaps I could separate Louisa and Jo; but I have (and there you see my main teaching challenge: many of my students have learned their “history” from films). Stacy Tolman drawing of Louisa, reproduced in Lilian Whiting’s Boston Days (1902); a 1933 publicity pamphlet for George Cukor’s 1933 Little Women. Back to the book. I have several editions of Little Women, but my most prized one is an 1880 copy published by Roberts Brothers in Boston and illustrated by Frank Thayer Merrill. I’ve looked at other editions, but I like my Merrill best, and since I’ve made the Louisa/Jo connection, this is how I picture the Louisa and her world as well. The last way I picture Louisa is in Concord, at Orchard House and its environs. And when I think of her there, I wonder about her and her family’s relationship with Nathaniel Hawthorne, who purchased the Alcott’s first Concord house after he fled Salem. He renamed their “Hillside” the Wayside, and it is just down the road from Orchard House: apparently the Alcotts even became the Hawthorne’s tenants while their house was undergoing renovations. Nevertheless, the relationship does not appear to have been a close one, and I wonder why. A recent book by Eva LaPlante, Marmee & Louisa: The Untold Story of Louisa May Alcott and Her Mother, explores the relationship between Louisa and her mother, Abigail May Alcott, who was a descendant of the Salem Witch Trials judge Samuel Sewall. 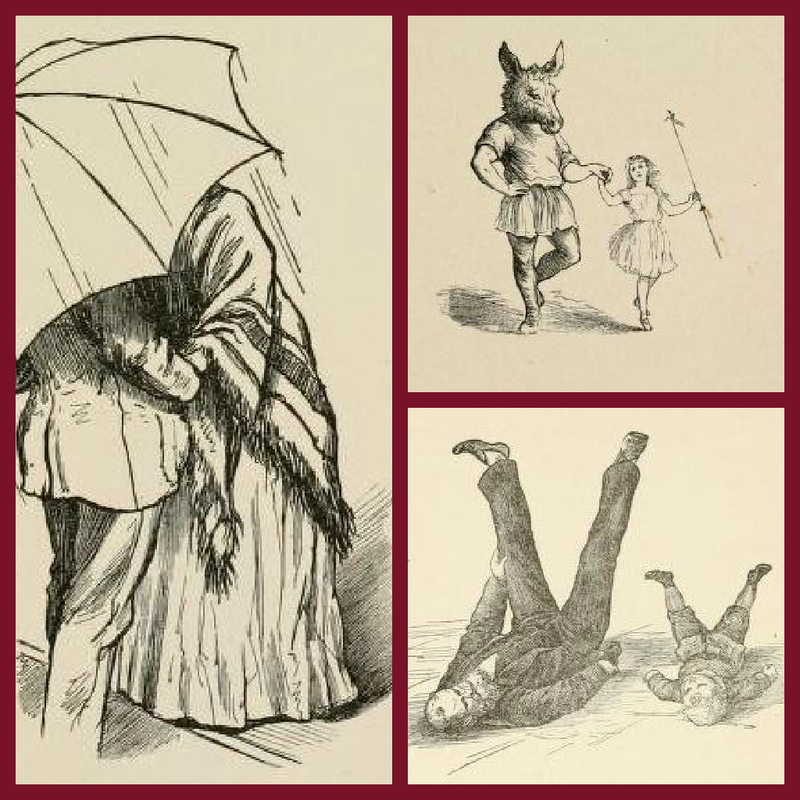 Of course, we know that Nathaniel Hawthorne was a descendant of another Witch Trials judge, John Hathorne. You would think that Louisa and Nathaniel could have bonded over these shared skeletons in their closets, but perhaps not.